Dr. Kowalik received his Bachelor of Science, 1969, and his Doctor of Dental Surgery, 1973, degrees from Loyola University. He afterward taught at Loyola Dental School in both the oral diagnosis and prosthetics departments. He has served on various committees for both the Illinois State Dental Society and the Chicago Dental Society. He's been president and served on the board of numerous dental organizations and the Burbank Chamber of Commerce. Dr. Kowalik has served as a counselor to the Chicago Dental Assistants Association. For more than thirty years he has been a member of the Dental Arts Club and the American Prosthodontic Society. He holds memberships in the American Dental Association, the Illinois State Dental Society, and the Chicago Dental Society. He holds a fellowship in the Academy of General Dentistry. He currently has over one thousand, nine hundred hours of continuing education in his mastership program. He's a graduate of the prestigious Misch Implant Institute and a fellow of the International Congress of Oral Implantologists. He's completed training in IV sedation at the University of Illinois Medical Center and holds a state license to provide this service. He maintains certification in Advanced Cardiac Life Support. Dr. Kowalik is a Certified Invisalign Provider. Many people think that being good is an endpoint to years of education and experience. I think that it is a starting point to a responsibility. Dr. Kowalik lives in Riverside with his wife, Linda. He enjoys bicycling, woodworking and gardening. 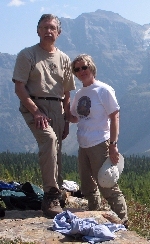 They have traveled and hiked many of America's National Parks.